Chelsea midfielder, Cesc Fabregas, has said he would love to stay at the club beyond this season. The Spaniard also admitted he wished Maurizio Sarri had arrived at Stamford Bridge sooner than this year. Fabregas was voted man of the match as Chelsea battled in a 1-0 win over Hungarian champions, Vidi in the Europa League group stage on Thursday evening, making only his third start of the season at the base of midfield. “I like it, everything goes through me. “This is what I like. I feel sensations under Sarri that I never thought I would feel again. To be honest touching the ball 100 times, all the play going through me or Jorginho is a very important role for him, I’m learning it, I’m very passionate about it as it’s very interesting. “The way [Sarri] sees football is something that may be in the future if I become a coach I think I’ll do something very similar to what he does. It’s what I like and how I see football. I’m learning a lot from here, it’s really interesting how he works and I’m really looking forward to working for a long time with him. “I wish he came a bit earlier to be honest, it’s a little bit late now in my career. 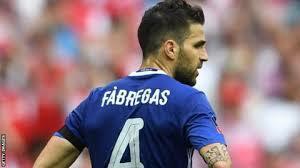 Definitely, I’m very happy with him,” Fabregas said, according to ESPN.